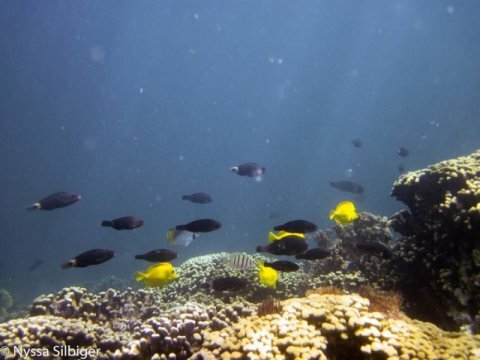 Coral populations’ recovery from disturbances is facilitated by increased success of juvenile corals after the loss of competing adults, according to a new study from CSUN marine biologists that was published in this month’s issue of the journal Ecology. The paper’s coauthors, CSUN Professor Peter Edmunds and graduate alumna Hannah Nelson, and Lorenzo Bramanti of the Observatoire Océanologique de Banyuls, tracked the “recruitment” of young Pocillopora corals in experimental underwater plots with the population of adult corals artificially thinned or left at undisturbed density. They also examined the distribution of corals in different age classes at undisturbed sites to test for clustering of similar-aged corals resulting from bursts of simultaneous recruitment in the aftermath of past disturbance. As the coauthors report, they found nonrandom clustering of older corals, and increased recruitment of young corals in the reduced-density experimental plots, both consistent with “density dependent” dynamics. Identifying these dynamics is important for understanding how coral communities can recover after both natural and human-caused disturbances, and helpful for planning coral conservation.